League of Legends' upcoming tournament, Clash, will force games into Sudden Death if matches last longer than 60 minutes. 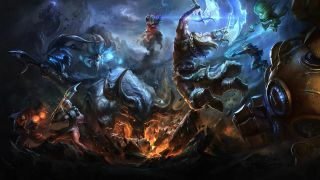 Riot detailed the feature in a FAQ sheet circulated to players on Friday, explaining that it wants to keep matches "at a fixed maximum length" to ensure it can stick to its planned activities. It then went on to detail specifically how Sudden Death will force a conclusion. "After 60 minutes, towers will become more fragile and easy to push. By 65 minutes, structures will start to damage themselves at a fixed rate in order (towers in order, then inhibitors, then nexus turrets, then the nexus)," the FAQ states. "By 70 minutes, one team will have won the game. This is considered a last resort and is very unlikely to happen, but we need to give all Clash matches a fixed maximum length." League of Legends' three-day online tournament mode, Clash, will begin on May 25. Players will be able to gather four friends and then compete across single-elimination games every other week on Friday, Saturday and Sunday, netting rewards such as logos and banners for wins, and trophies for becoming tournament champions.